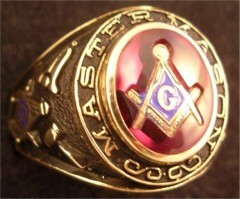 The Masonic Ring is the most recognizable symbol of the world's largest fraternity; the Freemasons. 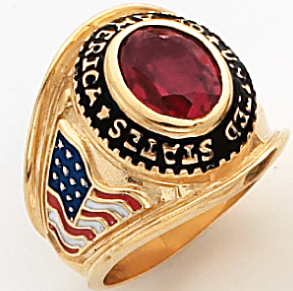 Most commonly, the Masonic Ring is shown with a compass and square on the top. The sides of the shank on the Masonic Ring typically display the plumb and trowel. 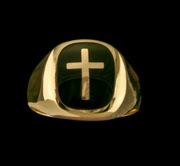 If the ring has a stone, it is typically either a black onyx, synthetic ruby or blue spinel. 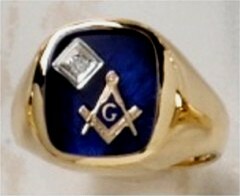 The color of the stone on the Masonic Ring has no significance. There at least a couple of opinions as to whether the wearer of the Masonic Ring should wear the ring with the points of the compass either facing towards the wearer or away from them. The square is the symbol of all earthly, the compass of heavenly perfection. As a combined emblem, the ends of the square point up as a symbol of man's aspirations toward God; the points of the compass point down to represent heavenly qualities coming down from God to earth. Given that, it seems that the proper way to wear the Masonic Ring would be that in which it's symbolism is best expressed; namely; when the hand is held in its usual position the points of the compass are towards the earth and away from the wearer's eyes. To the best of my knowledge, the Grand Lodge has not ruled on this subject. 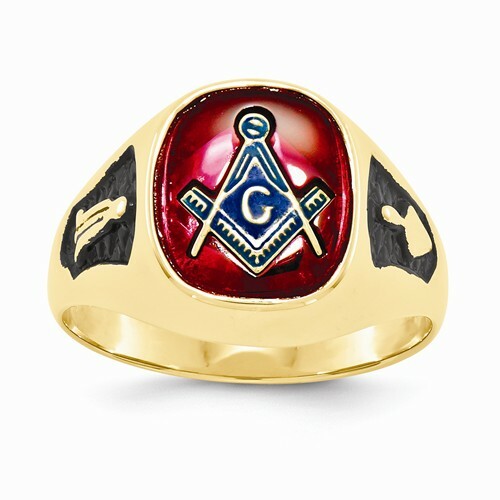 In order to wear the Masonic Ring, you must have achieved the degree of Master Mason. The Freemasons can trace their roots back to 1717 when four lodges in London joined to form the Grand Lodge of England. Some historians say that the freemasons can trace their roots back to the time of ancient Egypt.